The 28th session of the Human Rights Council (HRC28) saw a number of developments with highly significant implications for the future of the Special Procedures mechanism, the ‘jewel in the crown’ of the UN’s human rights protection system. Some of these developments were undoubtedly positive and in line with the recommendations put forward in the recent Universal Rights Group-Brookings Institution policy report on Special Procedures. Others, with potential implications for the independence and effectiveness of the mechanism, should give pause for thought, consultation and reflection. Starting with the positives, the URG-Brookings report drew attention to cooperation and follow-up/implementation as key ‘determinants of [the] influence’ of Special Procedures. Regarding cooperation, the report noted that the degree to which states are willing to cooperate with Special Procedures has a determinative impact on the mechanism’s ability to influence domestic human rights policy and practice, and that levels of cooperation (e.g. whether a state has a standing invitation to visit them, whether they respond favourably to visit requests, whether they respond to urgent appeals from mandate-holders) vary enormously between countries and regions. To improve levels of cooperation, URG and Brookings highlighted the importance of public disclosure and transparency (state by state) around indicators of cooperation, and also of having a space, on the Council’s agenda, to debate those indicators. Regarding follow-up to the implementation of Special Procedures recommendations, the URG-Brookings report noted that the overall lack of systematic follow-up – on the part of mandate holders and states – is a major drag on the effectiveness of the mechanism. Recommendations issued after, for example, a country mission, are too often put on a shelf never to be seen again. To rectify this problem, URG and Brookings proposed that more mandate holders pursue follow-up activities (at the moment only a handful issue follow-up reports), and that states report, perhaps under item 5 on the Council’s agenda, on what they have done to implement Special Procedures recommendations. In relation to both follow-up/implementation and cooperation, URG-Brookings also underscored the importance of deeper ‘systemisation’ of the Special Procedures – in other words, mandate holders should improve coordination and project influence collectively (as a mechanism) as well as individually. With these points in mind, HRC28 saw three extremely significant developments. This new annual report contains valuable information on state cooperation, implementation and follow-up activities (building on the existing communications reports). On cooperation, the report provides information on levels of state responsiveness to Special Procedures urgent appeals and other communications, noting that states responded to only 42.7% of all communications in 2014, and that even amongst those responses there was considerable variation in terms of substance, with some merely offering an ‘acknowledgement of receipt’ while others did provide ‘more substantive replies.’ The report also includes important cooperation indicators covering standing invitations (annex III), visits undertaken (annex II) and a listing of countries that have never received a visit (annex IV). The report also reflects and seeks to promote good practice in the area of follow-up/implementation, by providing a ‘non-exhaustive list of follow-up activities undertaken by mandate holders’ (annex IX). Responding to these two historic steps (the new report and the presentation), a cross-regional group of 44 states delivered a statement welcoming the ‘additional information contained in the report,’ and the presence of the Chair, which they said is a way of optimising ‘regular interaction’ between the Council and the Special Procedures system. The third significant development was the use of the item 5 General Debate as a forum for states and the Special Procedures mechanism to engage in a dialogue on follow-up to the implementation of recommendations. The annual report and the presentation of the Chair both drew attention to good practices, from both mandate holders and states, in this area. For their part, states took some first tentative steps, in line with URG-Brookings recommendations, to use the item 5 General Debate as a platform for sharing information on the national implementation of recommendations following country missions. So what of avoiding a possible step back? The 28th session coincided with an announcement by the High Commissioner for Human Rights, Zeid Ra’ad Al Hussein, of a ‘significant reorganisation of [his] Office, based on the outcome of an extensive functional review.’ The main thrust of the reform is a decision to ‘devolve greater resources from the headquarters to the field,’ including through the establishment of seven new regional hubs, and a strengthening of OHCHR’s New York office to ‘reflect our increasing involvement in discussions on peace and security, the right to development and rule of law.’ This proposed reorientation has been widely welcomed and is in-line with the changing demands placed on, and the changing outlook of, the OHCHR. The reorganisation will also see changes at OHCHR headquarters in Geneva. This will include ‘the establishment of three technical divisions in Geneva, instead of the previous four: the new Mechanisms Engagement Division; the Integrated Country Engagement Division; and the Research, Policy, Methodologies and Special Procedures Division.’ As is hinted by these new names, the restructuring will include moving the Office’s secretariat function for Special Procedures from its current home in the division dealing with the Council and its mechanisms, to the Research and Policy Division. (Linked with this move, Treaty Bodies will cease to be the responsibility of a separate Division and will move under the new Mechanisms Engagement Division). It is this transfer of the secretariat of thematic Special Procedures (country mandates, in any case, sit elsewhere – with the current Field Operations Division) away from the secretariat of the Council and its mechanisms (to be replaced by the secretariat of the Treaty Bodies) and towards the Office’s research and policy function that should give pause for thought. The rationale is clear: to identify and benefit from synergies in the headquarters and reduce duplication and overlap, thereby ‘generat[ing] savings, which [the Office] will be able to re-invest in core activities’ The reform, it should be recalled, comes against a backdrop of unprecedented financial challenges for the OHCHR. However, the potential risks are equally evident: that it may blur the line between the OHCHR’s function as secretariat to the independent Council mechanisms, and its role as the lead entity on human rights within the UN secretariat – under the direction and authority of the Secretary-General. 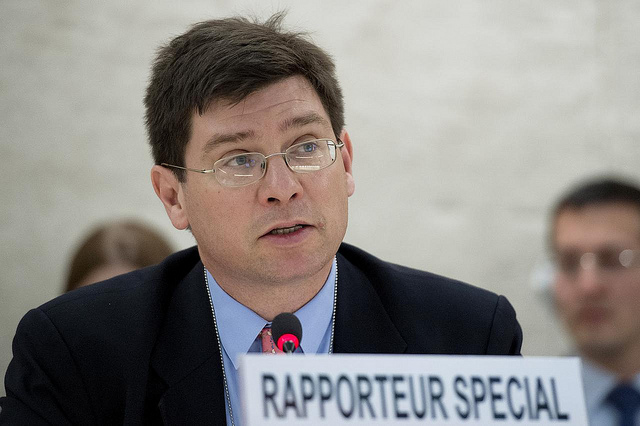 URG research has highlighted the central importance of the independence of Special Procedures mandate-holders – and their assistants – from undue outside influence (including states, NGOs and other parts of the OHCHR). That is why Special Procedures Branch (SPB, initially established in 2003) is so important and why URG argued, in its recent Policy Report, for it to be strengthened (in terms of human and financial resources), expanded to include country mandates and, to as great a degree as possible, ‘ring-fenced’ within OHCHR. The question then is how the merger of SPB with the Office’s research and policy function (individuals who, for example, prepare thematic reports for the High Commissioner), will impact on the independence of Special Procedures as a key mechanism of the Council. It is too early to draw any firm conclusions. The devil will, as always, be in the detail. OHCHR is still discussing and reviewing the implementation plan for the changes. However, at least one point is clear: any reform that may affect the independence and impartiality of Special Procedures, and the level of secretariat support they receive, must be implemented carefully and in consultation with Special Procedures themselves (while respecting their independence and the independence of OHCHR). It is to be welcomed, in this regard, that the High Commissioner recently discussed the reorganisation with the Coordination Committee of Special Procedures. These substantive variations in the quality of state responses to Special Procedures were analysed in our 2014 report with Brookings Institution. Algeria, Australia, Austria, Belgium, Botswana, Bulgaria, Colombia, Costa Rica, Croatia, Czech Republic, Chile, Denmark, Estonia, Finland, France, Germany, Greece, Honduras, Hungary, Ireland, Iceland, Italy, Japan, Latvia, Lithuania, Luxemburg, Mexico, Moldova, New Zealand, Netherlands, Norway, Peru, Paraguay, Poland, Portugal, Slovakia, Slovenia, Spain, Sweden, Switzerland, Uruguay, UK, Tunisia, Turkey, Argentina, El Salvador, Cyprus and Andorra. Statement by the High Commissioner for Human Rights during the High-level Segment of the Council, 28th session, March 2015. Statement by the High Commissioner for Human Rights under item 2 of the Council, 28th session, March 2015. Image “Human Rights Council” by UN Geneva, licensed under CC BY-NC-ND 2.0.